We’ve all been there: You feel an unfamiliar pain, notice an odd bump or discoloration, or come down with a strange cough that doesn’t go away. The thought turns into worry, which leads you to Google, and down the rabbit hole you go. The problem is that sources like WebMD seem to lead you to all the worst-case scenarios. Feeling an itch? It’s a horrible STD. Got a bad headache? You’ve got cancer. Bit of a fever? Ebola. But instead of quelling your fears, we wanted to give you an idea of what other people around you are anxiously searching for in the late-night hours. Use the map above to find out what your state is the most worried about. We used Google Trends data to identify the most-searched health conditions over the past year. Then we analyzed each condition’s search volume on a national level to find the conditions that were searched most by residents in each state and Washington, DC. We also looked at other data, like STD and obesity rates, to see if we could find any correlations between what people search for and the types of conditions that are common where they live. Our results may not cure your paranoia, but they should cast some light on what your home state is most concerned about. Now, let’s break the numbers down by state. But be careful—what we found may only add to your anxiety. Look again at the map of each state’s most googled health concerns. Are there some details that stand out to you? These are just a few highlights from our search term research that we found enlightening. Nationwide, the most frequently searched health concerns were diabetes and asthma—10 states searched for diabetes and seven for asthma. Considering that, according to the CDC, more than 9% of Americans1 have diabetes and more than 8% have asthma,2 it’s not surprising to see a larger portion of the country searching for these conditions. For some reason, North Dakotans can’t sleep—they searched insomnia the most. Could the state’s poor restfulness be due to its long summer days? Alabama and South Carolina are feeling the itch. Both states searched about itchiness the most, and it made us wonder why. There’s more on that in our “STDs” section below. Arthritis was the top concern in Idaho, Minnesota, Rhode Island, and Vermont. In all these states except Minnesota, the prevalence of arthritis3 among adults was higher than the national average.4 Could all the furious googling be leading to stiff joints? Delaware, which has one of the highest breast cancer incidence rates in the United States,5 also had breast cancer as its top googled health concern. Binge drinking is a big problem in Montana,6 and the state’s Google searches for alcoholism may point to these worries. Poor Wyoming, they’ve got the runs. We’re not sure why people in the Cowboy State are paranoid about diarrhea, but we send our love. Another common worry of googlers was sexually transmitted diseases (STDs). Here, we did find some interesting correlations between search and health data. Four states searching about STDs—Alaska, Louisiana, North Carolina, and DC—were listed by HighSpeedInternet.com as having the five highest STDs rankings. We dived into the data even further. We pulled data on the prevalence of one serious STD—syphilis—and then compared them to our list of states that searched for STD-related terms. Sure enough, six states and DC had some type of STD as their top online health search term, and these areas also had some of the highest prevalence of syphilis among their populations. Perhaps these individuals are more aware of and concerned about serious STDs after being infected or knowing someone who has been diagnosed with an STD. DC and Louisiana residents’ biggest health concern was HIV, and sadly, the data we found showed that these areas have very high rates of HIV diagnosis.8 In fact, DC had the highest HIV diagnosis rate in the United States in 2015, at 66.1 per 100,000 people. What’s more, two states with high chlamydia rates—North Carolina and Alabama—were super worried about itching. We don’t want to take the assumptions too far, but considering these states also have high STD rates—well, it’s certainly interesting. Respiratory conditions: Just a little cough, or sign of impending doom? Eight out of 14 states that searched respiratory-related terms—asthma, bronchitis, coughing, and flu—may be onto something. Besides cancer and heart disease, people in these eight states are most likely to die from respiratory disease. Could this be one example where people’s Google-based paranoia could lead an individual to get the help they need? Or is all the coughing an omen for things to come? Montana’s chief concern was alcoholism, and the state indeed has the ninth-highest rate9 of alcohol use disorder (6.95%) in the nation. We hope Montana residents struggling with alcohol can get the help they need—and find more time to get outside and enjoy their home’s big, beautiful skies. In Alaska and Maine, drugs were top of mind for online searching. Again, we found correlations with health data. Alaska has the highest heroin use rate and Maine has the ninth highest. With so many people who have alcohol or drug disorders, maybe these states are just worried about their neighbors. Obesity and diabetes: A growing concern? 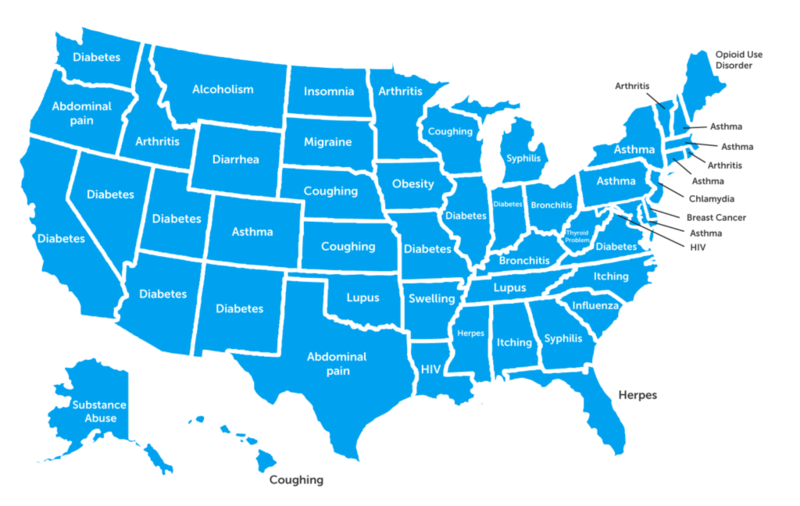 As we said earlier, our research showed that diabetes was the most frequently searched health concern among the states. Because obesity is considered the best predictor of type 2 diabetes,10 we wanted to see if we could find a correlation between the states that were worried about diabetes and rates of obesity. But when we looked at the data, we actually found that the states with the highest obesity and diabetes rates did not search for these conditions more often. Maybe when it comes to obesity and diabetes—which have become so common in the United States—people are less worried that the conditions will affect them negatively. Check out the chart below for our findings. The state most concerned about obesity over all else was Iowa. What do we think makes Iowans so paranoid about obesity? Well, the state does have a higher-than-average obesity rate,13 though not one of the highest. Perhaps there’s just too much corn in the diet? From STDs to coughing, each state has its own prime paranoia. If you’ve found yourself worried you have a fatal disease thanks to a quick Google search for “itching,” rest assured you’re not alone. But maybe we all just need to cool it with the furious internet searches and visit an actual physician instead of consulting Dr. Google every time we feel an itch. Or if you’re in Wyoming, we’ll just recommend some Imodium.